TakeNGive: In retrospect, I'm mortified by my actual move in this game. I have a couple ideas about what I should have done; but I'm interested in where you would have played now, as Black? Thanks! 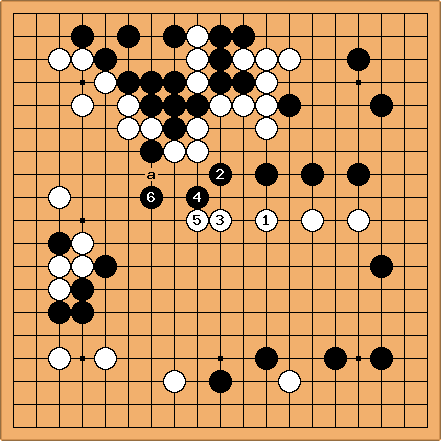 Black's turn... can this be salvaged, or is resignation the tesuji? Here's a possible way of playing. 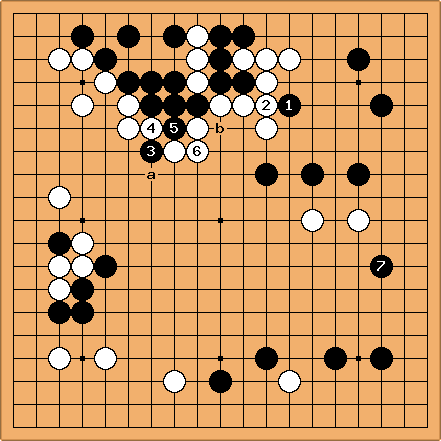 After playing 1-6 to weaken White's group at the top, Black can start attacking the white group on the right with 7. With the threat of the extension at a and peeps against the cutting point at b, the top group is far from safe. And whatever side White plays on, Black keeps the two white groups separated with a move around tengen. If White runs with his group on the right, these moves will keep up a strong attack on both sides. After this sequence, White will have to defend against the connection at a. In my view Black should first reinforce the weak group in the lower left with 1 and 3. This looks ahead to an invasion at a at some future time. The biggest point on the board might be near the marked white stone - for example at b. Black can play there next, if given a chance. An attack in the centre isn't likely to be successful until Black has an overall stronger position.